Throughout the grim economic statistics of the last five years, I've felt especially badly for three groups: those who have been unemployed at a time when finding a job has been so tough; young people trying to get a foothold in the stagnant labor market; and those who were near or into retirement. This last group is old enough that spending many more years in the labor market wasn't a realistic option, even if jobs had been available. Meanwhile, they saw the value of their retirement nest eggs slashed by falling house and stock prices, and have watched while their savings and money market accounts brought them only ultra-low interest rates. LaVaughn Henry offers some evidence on these points in "Are Households Saving Enough for a Secure Retirement?" an "Economic Commentary" written for the Federal Reserve Bank of Cleveland. One rough-and-ready measure of how older generations are doing is to look at the accumulation of national wealth. 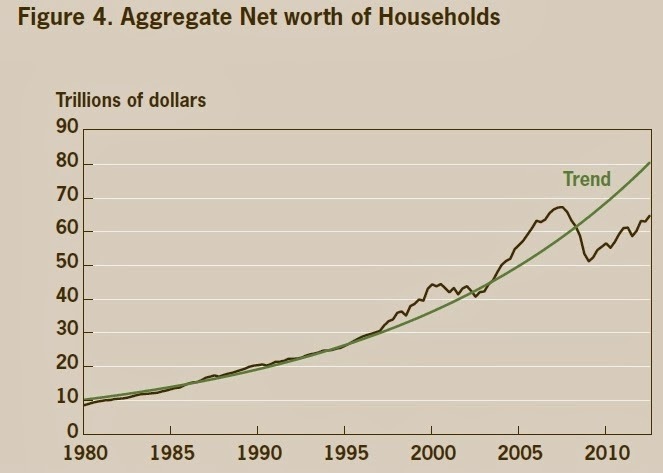 Here's actual household wealth, with the brown line showing the actual pattern and the green line showing a steady-growth trend over time. 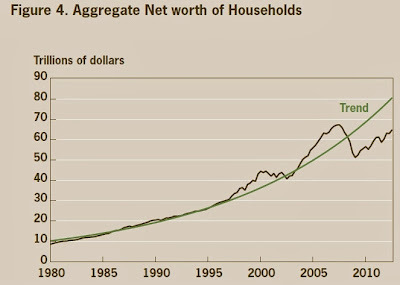 Notice that wealth went above trend in the dot-com boom of the late 1990s, but at the end of that period wealth returned to more-or-less the long-term trend. However, in the housing bubble of the mid-2000s, household wealth not only went further above trend, but then fell to well below trend and has been slower to rebound. 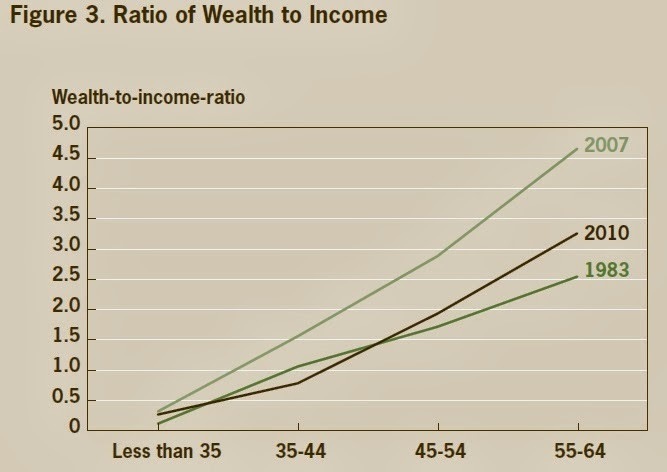 How do wealth patterns look for near-retirement Americans in particular? 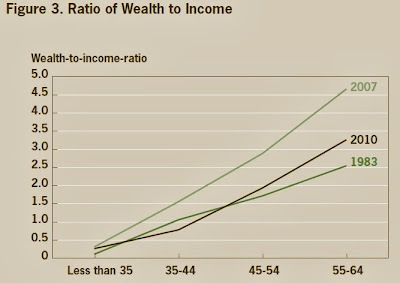 This graph shows the ratio of wealth-to-income for four different age groups at three different years. 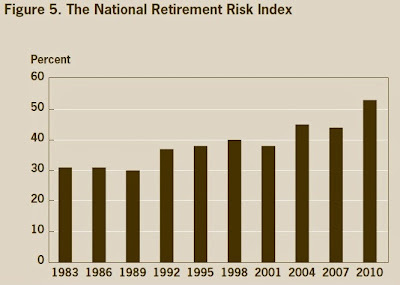 Clearly, those in the 55-64 age bracket were feeling a lot better about their retirement prospects in 2007 than they were in 2010. Although a quick glance at this figure might suggest that older Americans as a group are just as well-prepared for retirement as they were back in 1983, this conclusion would be too quick. As Henry points out, wealth-to-income ratios for the elderly should probably be higher now than in the early 1980s for three reasons. First, people are living longer, so they need more wealth when they retire. Second, back in the early 1980s, a larger share of the US workforce had "defined benefit" pension plans, in which an employer promised to pay them a certain amount that was not counted as part of their own household wealth. Now more people have "defined contribution" plans, where your retirement funds are stored up in your own 401k or IRS account, which does count as part of your household wealth. Thus, retirees are more dependent on their own household wealth than they were three decades ago. Third, interest rates right now are historically very low, so retirees need more wealth to generate the income that they would have expected if interest rates were higher. standard once they stop working since they pay less in taxes, no longer need to save for retirement, and often have paid off their mortgage. Thus, a greater share of their income is available for spending." Using this measure, Henry presents a figure showing the share of households at age 65 that are at least 10% short of meeting this target. 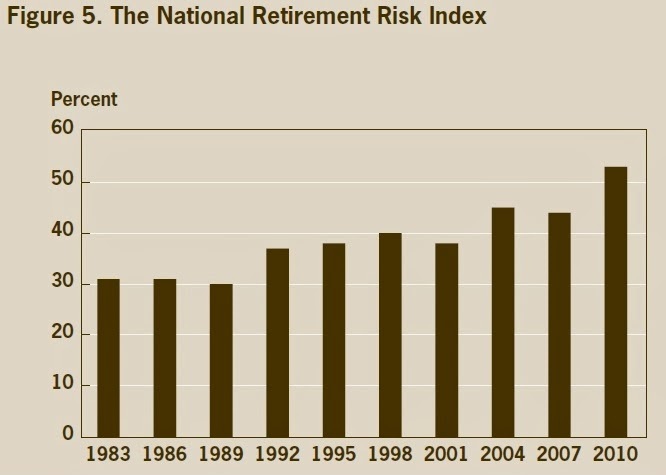 This particular rule is of course somewhat arbitrary, but the results are likely to look much the same for any given rule: that is, those in the 1980s were more likely to be ready for retirement than those in the 1990s; those in the 1990s were more likely to be ready for retirement than those in the 2000s; and those in 2010 were least likely of all to be ready for retirement. There's an argument for another day about how to encourage people to save more for retirement during their working lives, but that argument isn't especially relevant to those who are already at the edge of retirement or already retired. Planning for retirement is an especially difficult economic decision because we get just one chance to do it; no one gets to live their life multiple times, trying out different patterns of saving and investment each time. And if you happen to be retiring just when the economy enters an epic slump, it's bad luck.